The Sheffield South Island Laser Championships were held at NPCL on the 25/26 November. Entries were from as far afield as Dunedin, Picton and Nelson. There were 22 Radials and 7 Full Rigs competing. Race 1 on Saturday started in a light SW and had to be abandoned as the wind died away and the good old NE arrived. This meant a beat up the harbour to a different race course area. Racing got away again about 12-30 in a building Easterly and 3 races were completed in 14-21 knots. Alistair Gifford, fresh from his 2nd place in the youth trials, dominated the Full Rigs with local hopefuls Tim Pitcaithly 2nd and Master Chris Shannon 3rd in each race. In the Radials, previous winner Peter Graham from Dunedin had a 1,2,1 and female Master Jenny Armstrong (previous Olympic Gold 470 medallist) also from Dunedin was in a tied position with local Hamish Atkinson with 2,3,4 scorecards. Charles Corston won race 2 convincingly and then in race 3 dislocated his shoulder again so, unfortunately, had to painfully retire from the series. On Sunday, we sailed a little further up the harbour with another 3 races in champagne 14-20 knot Lyttelton Easterly conditions. For the Full Rigs, it was much of the same with Alistair getting 3 deserving bullets, followed by Tim with 3 seconds and Sean Thomson 3 thirds. In the Radials, Peter also had 3 bullets, and Jenny and Hamish continued their 2,3,4 placings. Simon Wilson had blistering pace for a 2nd in Race 4 and 3rd in Race 5. Simon finished 4th overall and had some good capsize practice and may consider bringing his snorkel and mask up for the Nationals! Full Rig prizes went to Alistair for 1st Youth, Tim for 1st Open and Sean for 1st Master. Radial prizes went to Peter for 1st Open, Jenny for 1st Female and 1st Master and Harry Corston for 1st Youth, and unofficially Greg Corston for the most UFD’s. Thanks very much to Ross May the Race Officer, Phil Foulter race management, and the race boat helpers. Looking forward to some more of the same hopefully in January at the Sheffield Nationals. 6 Kiwis and 60 Aussies might seem a bit of a one sided contest but during 4 days of blue skies, light warm breezes and wonderful hospitality at the SPLM in Brisbane the Kiwis certainly held our own and were able to give the Aussies a few lessons on the way through. We had a variety of breezes, mostly light and variable as is typical for this time of year in Brisbane, but we did enjoy a nice shifty challenging offshore (just) hiking breeze on day 3 as a change from the 4-8 knot "sea breezes" on the other 3 days. It was pretty much flat water the whole time but there were big tides that had to be respected and used wisely to get ahead of the very closely bunched fleets in both the Radial and Standard. In the Radials it was a 3 way contest from the start between Kiwi Scott Leith (M) and Queensland locals Mark Kennedy (GM) and Danny Fuller (A). It was close all the way but Scott was able to keep control of the contest to win overall by a couple of points from Mark, with Danny having to carry a 15th from the second to last race to finish a few points further back. After having a look at the forecast, waifes like Mike Knowsley (M) changed to the Standard fleet at registration and went on to record a couple of excellent bullets, joining GM's Chris Sadler and Gary Lock, who also scored bullets, in making sure the Aussies knew we were there. Unfortunately, unlike Scott in the Radials true consistency deserted all the Standard rig kiwis. Local heavies ex World GM Champ Greg Adams & Brad Taylor (GM), Chris Dawson (GM) from Sydney and David Waite(M) from Perth ended up at the top of the Standard results. They were closely followed by a flock of kiwis including Chris in 5th, GM's yours truely and Gary in 6th and 7th and Mike in 8th in the 35 boat fleet. GGM Bob Blakey finished mid fleet after pulling out early on the last day with the excuse of "having to get ashore to meet an old mate for drinks". Bob was spotted on the flight home the next day so it could not have been too tough a session. So overall another great regatta to follow up on the trans tasman rivalries from the World Master Games and not a foil, X box or pedal in sight. Next opportunity to take on the Aussie Masters will be their Australian Laser Masters on the ocean at Mooloolaba in February, at which they tell us all kiwis will be welcome! They are expecting 250 masters so it should be a really great event so why not put it in the calendar and give it a shot. Another stellar Laser regatta as the local Laser Masters fleet warms up for the World Masters Games, which kicks off in two weeks. 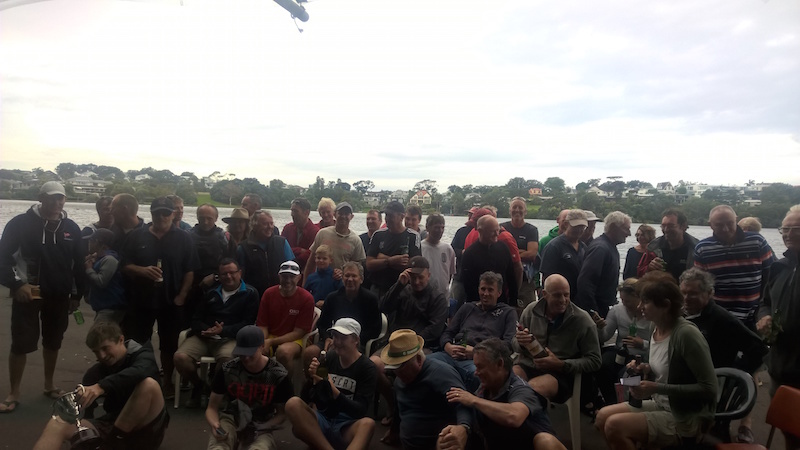 Following last week's Auckland Masters at Tamaki, which attracted a record fleet of 66, this weekend 45 Masters and a few younger guys turned up for two days of light to moderate E/NE racing at Pupuke. The lake provided typically challenging gusty and shifty conditions for the 31 Standard and 16 Radial sailors, not to mention challenges for race officer Garth Briden. Saturday was the lighter of the two-day, with 4 races completed in a 5 to 10 knot breeze that started in the E and moved around to NE during the day while on Sunday there was a bit more pressure with the early NNE gusting up to 15 knots before moderating and turning Easterly for the 3rd and last race of the day. The Radial fleet saw a really close contest which was only decided in the last race. Youth Joshua Bull convincingly took out race 7 to secure the title by a single point from Master Richard Blakey, who was 2 points ahead of Apprentice Phil Wild with first GM Kevin Welsh in 4th. Kevin was unlucky not to take out the Masters title after getting a UFD when he had won race 3 on the water. Last weeks Radial winner at the Auckland Masters Werner Hennig was a close 5th followed by first women, Michelle Bain in 6th. Sueellen Davis kept Michelle honest in 7th overall, a great performance as she has only just got back into the Laser ahead of the WMG. The Standard fleet was dominated by three sailors. Top youth sailor Josh Armit gave all the masters sailors a true lesson in lake sailing, with 5 wins and 2 seconds, and showing an amazing ability to read the conditions and either dominate from the start or work his way to the front of the fleet on the rare occasion he got buried and gave the rest of us a chance. Almost as impressive were Masters Rohan Lord and Giles Grigg. Rohan won the two races Josh when "stumbled" and was consistently in the top 5 in all the other races, as was Giles. While Josh and Rowan were able to break away from the rest of the front bunch to win their races there was incredibly close racing in the rest of the fleet, with the top half of the fleet regularly bow to stern at every mark throughout the races. This made consistency incredibly difficult to achieve and all the rest of the fleet ended up carrying a couple of higher scoring races. Third Master and 4th overall was local lake sailor Tony Nicholson, who had a great run of pin end starts and just pipped top GM Mark Oliver in 5th overall. Past multiple NZ Masters National Champion, Apprentice Kris Decke struggled for consistency and ended up first Apprentice but 7th overall. Pupuke provided the usual generous selection of prizes to finish a very enjoyable weekend. The last formal warmup regatta before the WMG is at Takapuna Friday/Saturday next weekend then it is on to the big Masters' event of the NZ season, the World Masters Games at Torbay, with 10 races over 5 days certain to provide top quality racing for the 170 Laser Masters entered. 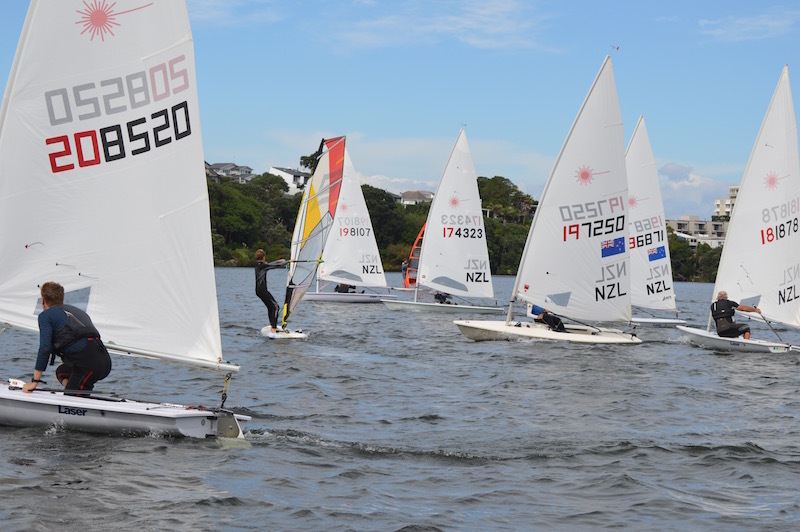 There were testing conditions at Tamaki for the 2017 Auckland Laser Champs on the 1st and 2nd of April. The 66 strong fleet is the largest we can remember in recent years, with many masters getting on the water time prior to the World Masters Games. RO Garth Briden (who else) did an excellent job getting us 7 races in light and veering N to NE winds and big tides. The first race on Saturday was light NE but fair. The first attempt at a second race was abandoned when a small group jumped out ahead while the majority parked up at the wing mark - a robust discussion on events ensued. Some sailors waited ashore for the breeze to settle in. And when it did a pretty even second race was completed. The 3rd race was completed in a dying breeze that caught a few out. 4 races were completed on Sunday. Races 4 & 5 started in a Northerly breeze and a triangle, which shifted right half way through race 5. It hung in long enough to finish races 6 and 7 on a windward leeward course. Garth tried to control the general recalls with the U flag as the tide flowing over the reef and under our bows pushed us over the line. Despite the light breezes, the waves (some would say slop) could be worked - but carefully. Even the successful sailors had a few trying moments. On the water Josh Armit was the most successful in the standard fleet. But he doesn't count as he's only 15 and we get sick of him winning everything. Dan Slater eventually came out on top master in the Standard fleet. And Werner Henning won the radial fleet on countback, being tied at the top with Richard Blakey. Great to see Jim Quinn winning the Legends Radial division with a brand new knee. For others Sunday's roast beef sandwiches were the most successful part of the regatta. A gorgeous day, some Hawaiian leis and big smiles from the Kohimarama organisers welcomed on 18th March eight women representatives coming as far as Port Ohope and Hamilton It was great to see sailors from 7 different clubs that are championing women sailing supporting this event. It was the girl's regatta at Kohimarama, so the laser women were surrounded by the future new pool of women laser sailors hopefully, who were competing in Optimists or Starlings for the top spot. 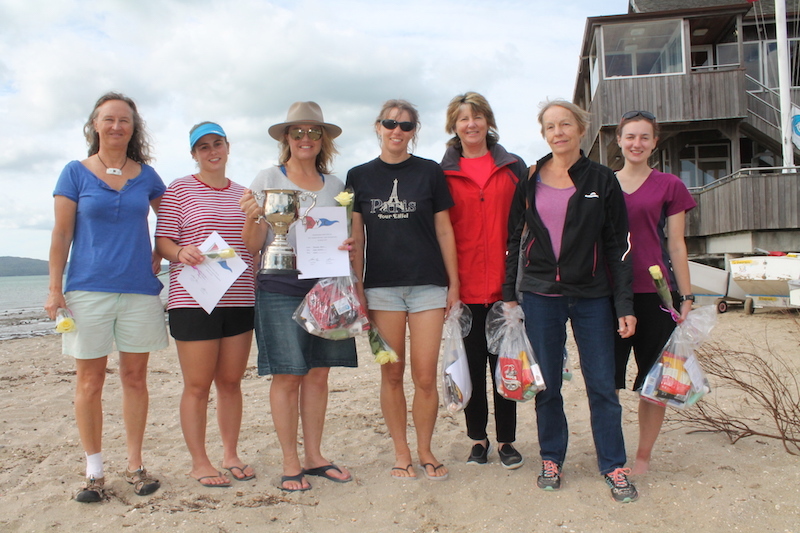 Michelle from Torbay Sailing Club won the day after some tough competition between Libby from Kohimarama, the previous 3 times women reigning champion, who came second and Georgina from Wakatere Boating Club came third. 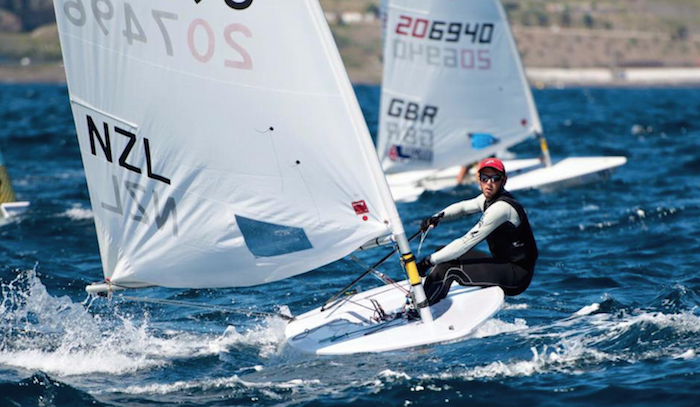 Heather enjoyed learned a lot about choppy sea conditions and capsizing and will take these learning to the Laser World Champs in April at Torbay. Taylor showed up the next day at the Club wondering why nobody was there. We would like to thank Kohimarama Yacht Club and the team of volunteers for making this another successful Auckland Women Laser Champs. All ladies thoroughly enjoyed it and enjoyed the treats: the voucher to PredictWind, the white rose and all the goodies in the pack. We were back at the Lake Taupo Yacht Club for the 2017 NZ National Laser Champs. The final day of the 2017 Laser Nationals at Lake Taupo dawned with strong Northerly winds and heavy rain from the weather system that affected most of NZ today. Contrary to the forecast the wind moderated a bit and the skies cleared as the morning progressed and the PRO and his team were out on the course looking to get the races started on time. Alas it was not to be and with a 30 knot squall coming through the course just before the D flag was due to go up, gale warnings in place and the wind forecast to rise even further during the afternoon the decision was made to abandon racing for the day and declare yesterdays results as final for the contest. So after 3 days quality racing in fresh conditions defending champion Andrew McKenzie was crowned NZ Laser champion again in the Open fleet but we have new champions in the other 3 fleets. Outstanding youth sailor Josh Armit was victorious in the Open Radial fleet while apprentices Phil Wild in the Masters Radial and Anthony Merrington in the Masters Standard both won their respective titles by just a single point. Other division winners included last years Radial champion George Gautrey, who picked up the Under 21 cube in the Standard fleet and Open Women's champion Susannah Pyatt and Youth Women's champion Olivia Christie in the Radials. In the Standard Masters Giles Grigg was second overall and the leading Master, Peter Kempkers the leading GM and John Pitman from New Plymouth the first Great Grand Master. In the Radial Masters Richard Blakey was only 1 point behind Phil to be leading Master, Hamish Atkinson from Naval Point in Christchurch, host for next years Nationals, was the leading GM and Gus Fry from last years hosts Muritai the leading GGM. So an extremely successful and well run contest is concluded with many sailors looking to meet again in only a couple of weeks at the Oceanbridge NZL regatta at Murrays Bay. 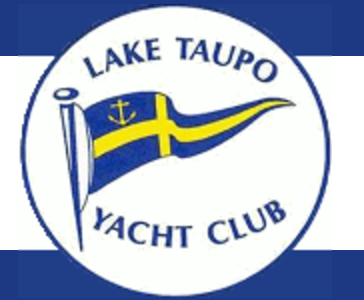 Special thanks to LTYC for hosting the contest so well and Bayleys Taupo for their support of the regatta.